Mouthwatering steaks and succulent seafood are the stars at this Beloit steakhouse, but there’s plenty more to experience inside. Find out how this hangout at Ironworks Hotel pays tributes to its hometown in many ways. 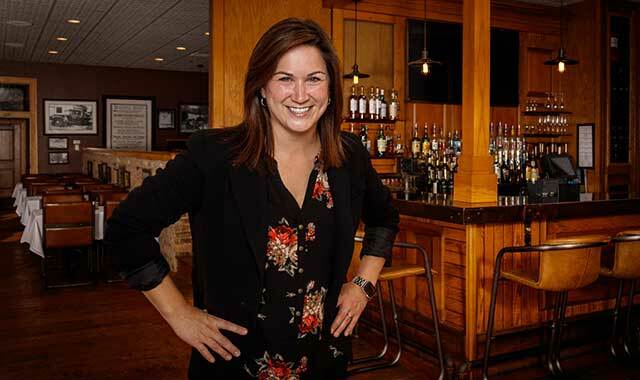 Jayme Braatz, general manager of Merrill & Houston’s Steak Joint, in Beloit, strives to provide a cozy and familiar environment to diners. There’s something that should feel cozy and familiar to diners at Merrill & Houston’s Steak Joint, 500 Pleasant St., in downtown Beloit. And proud they can be. The classy American steak house inside Beloit’s Ironworks Hotel has quickly become a signature destination for high-quality steaks and seafood. It’s a popular place for casual nights out and special occasions such as holidays, birthdays and engagements. But the expertise of the staff and their dedication to service are what truly distinguish Merrill & Houston’s from other steak houses, says Braatz. Seafood and steak dominate the menu, which features prime cuts of steak, choice fish and entrees such as chicken carbonara, veal Marsala and duck a l’orange. Enjoy a little seafood and steak together with The Ironworks, a 14-ounce rib-eye steak topped with shrimp, scallop and lobster meat blended with buttery breadcrumbs. It’s one of the more popular dishes. “You put all of that together, and you have pure ecstasy,” Braatz says. The Cowboy, a massive, 22-ounce bone-in rib-eye, is also a menu staple. On the seafood side, popular dishes include the seared tuna with bok choy, sweet chili and wasabi cream; Australian lobster tails served with drawn butter; and the seafood Alfredo, which comes with lobster, shrimp and scallops in a rich Alfredo sauce served over pasta. Merrill & Houston’s also has an extensive beer and wine menu, with premium selections of cabernet, merlot, pinot noir, chardonnay and various champagnes. Seven beers are on tap at a time, with new selections arriving each night. Twenty varieties, mostly craft brews, are available by bottle, including Spotted Cow from New Glarus Brewing Company. A seasonal patio out back, stationed along the Rock River, provides seating for about 40 people in the summer and whenever the weather permits. Another 120 people can be seated in the main dining area. Local musicians provide live entertainment indoors most Friday nights. “Guests enjoy cocktails and dancing in the lounge which is always a great time,” Braatz says. Merrill & Houston’s opened in the summer of 2012 and pays tribute to Orson Merrill and George Houston – the founders of Merrill & Houston Ironworks, which at one time operated just across the river from Ironworks Hotel. Their manufacturing center eventually evolved into the Beloit Ironworks before becoming the Beloit Corporation. Now dubbed Ironworks Campus, the former factory houses a business incubator and several high-tech companies on 24 acres. Memorabilia relating to the factory and Beloit’s manufacturing history adorn the walls of Merrill & Houston’s Steak Joint, providing visitors a veritable time machine into Beloit’s past. The grill at Merrill & Houston’s opens daily at 4:30 p.m. It closes Sun.-Thurs. at 9 p.m. and Fri.-Sat. at 10 p.m. The bar opens daily at 4 p.m. This entry was posted on Tuesday, April 3rd, 2018 at 12:00 pm	and is filed under Annual Guide, Dining Guide, Top Posts. You can follow any responses to this entry through the RSS 2.0 feed. Both comments and pings are currently closed.